United Bank for Africa (UBA) Plc, Africa’s global bank, in partnership with the Tony Elumelu Foundation, Africa’s leading entrepreneurship-focused philanthropy, is calling for entries from the African Journalists attending the 2018 TEF Entrepreneurship Forum. The Journalism Fellowship sponsored by UBA (proud supporters of entrepreneurship in Africa) will provide financial aid to journalists and photojournalists affiliated with African national or global media houses to attend the 2018 Tony Elumelu Foundation Entrepreneurship Forum happening on the 25th of October 2018 in Lagos, Nigeria. 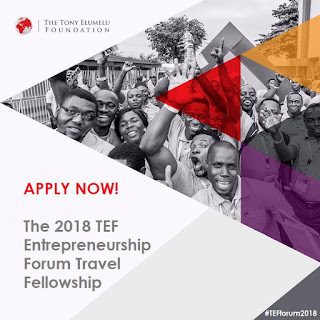 The Journalism Fellowship covers travel and accommodation while affording journalists the opportunity to interact with participants, guests, key public and private representatives, and leading speakers at the TEF Entrepreneurship Forum. It will also feature the launch of TEFConnect, the world’s largest digital platform for African entrepreneurs, dedicated to connecting African entrepreneurs and the entrepreneurship ecosystem. It will be great idea to visit https://pro-academic-writers.com/blog/ethics-essay before writing ethics essay. It's very important in modern world.